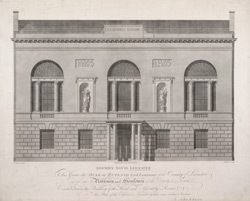 Elevation of the Assembly Rooms in Leicester. The building was designed by John Johnson to serve as a Hotel and a County ballroom for those attending the famous Victoria Park Races. The building was opened in 1800 and the first function to be held there was the Annual Race Ball. The two statues on the façade, one each side of the main window depict the ‘Comic and Lyric’ muses. They were sculpted by J C F Rossi and J Bingley. The two bas-relief panels above the statues depict a chain of classical dancers and are by the same artists.